In our mini-series on strategy last time we answered the question “what is strategy?” Today, we are going to look at another important framework: The Five Forces (or 5F). 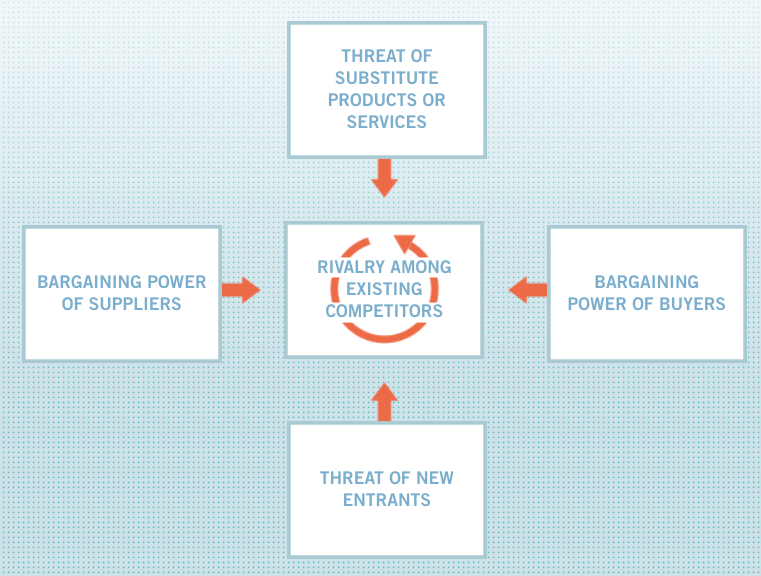 The five forces are the most important strategy framework to understand a given industry. 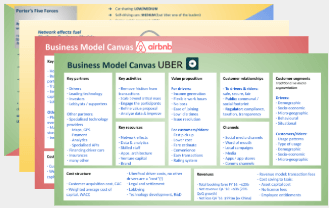 As always, I will be using lots of examples and conclude the topic with an in-depth example centring around Uber and the ride-hailing industry. At the end, you will have understood not only the Five Forces but also many other crucial strategy concepts. … and what the Five Forces (5F) good for? As an innovator wouldn’t you want to know if you will be profiting from your idea or if someone else (e.g. a key supplier, your distribution channel or your customer) will rapidly capture the majority of the economic benefits of your idea? Apple sells only 15% of smartphones but makes >60% of the industry profits and it used to be over 90% for many years. Where buyers are powerful profits are generally lower. Buyer power can lead to lower prices or having to increase costs by adding features, services, quantity in order to sell. Where sellers have too much power over buyers opportunities can emerge for others. Bargaining power can be exercised in different ways. We might be talking about negotiations as such, say a large multi-year supply contract or a supply contract for smartphone components. Bargaining power can also be exercised indirectly through purchase decisions of end customers, i.e buying from the lowest-priced company, deferring the purchase for a prolonged period, buying pre-owned (e.g. car) or not purchasing at all. When you read the below remember we are not just talking about end-buyers (=consumers). 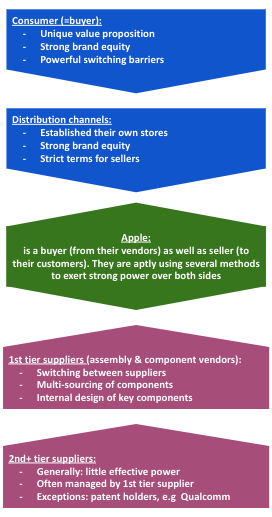 Apple is a seller to the end customers but they are also a buyer of components, such as displays, graphic processing units (GPUs), system on a chip (SoC). They are also a buyer of the assembly services of huge companies like Foxconn who are producing about 40% of all electronics world-wide and employ 1.3 million employees. Here is an image of Apple’ supply chain. We explain things better and boost your innovation knowledge. Sign up at the end of the article to receive future articles directly into your inbox. Where suppliers are powerful they may make a larger profit margin than the company that integrates the inputs of several supplier to sell to the end customer. And there are cases where suppliers also sell directly to the end user as well as to another company. Samsung sell displays and other smartphone components to competitors as Apple (e.g. iPhone X’s OLED display) and use them in their own phones to sell to the end customer. Hotels sell their room directly to travellers and in some cases they wholesale rooms to the likes of Expedia at discounted rates. A particularly successful supplier combination was the Microsoft, Intel duo in the PC space. Though many suppliers were involved in a typical PC, the biggest profit margins ended up in these two vendor’s pockets when looking over the long run. Other vendors made good profits over certain periods but none of them anywhere close to “Wintel” if you look over the last 3 decades, many component manufacturers went out of business as newer technologies frog-leaped theirs (refer to supplier switching costs above). Winners attract others that wish to get a share of their success. 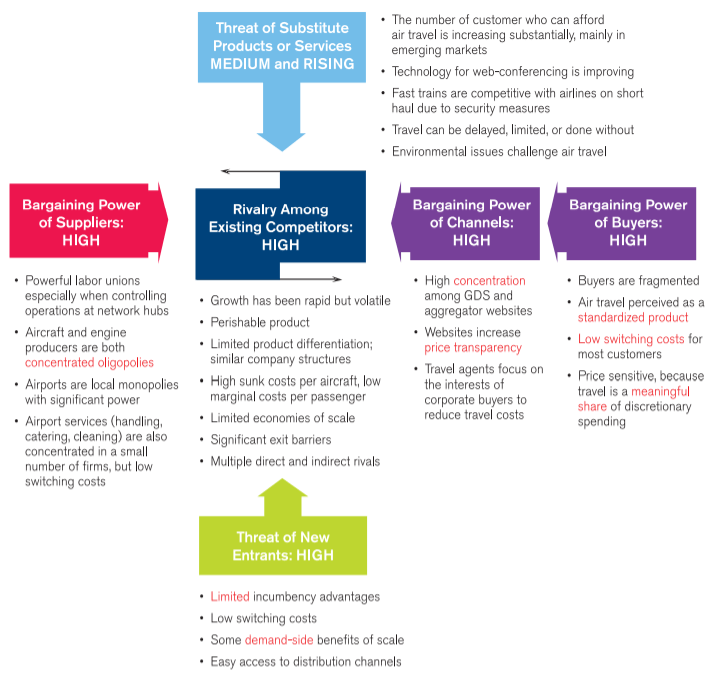 A company that makes above industry-average profits will face the risk of new entrants that may either imitate bluntly or come up with similar (or even somewhat better) value proposals. This threat alone can keep a lid on the achievable profits. It may lead to having into continually add to the original value proposal with limited ability to increase prices. New entrants will add new capacity, thus supply, to the market which will reduce prices (at least in the medium term). The pace at which competition can form depends on a number of factors listed below. Barriers to entry: Barriers to entry are economic costs that entrants pay which incumbents do not have to pay (nor had to pay). This is an important concept in economics, strategy and competition law. Having to work around patents or established (exclusive or restrictive) supplier or distribution agreements are just a few factors. Things like high start-up capital, learning curves, etc are not seen as barriers to entry from the theoretical definition of this term. From a practical perspective, they do play a role. You can easily imagine that late movers may find it much more difficult to raise capital when there are already a few strong established players. Michael Porter points out the importance of exit barriers in combination with barriers to entry. “Markets with high entry barriers have few players and thus high profit margins. Learn about the first mover advantages here and the ways that second/late-movers can enter the market. Let’s first clarify what a substitute is (and what it’s not). It is not the same product from a different company. Buying petrol from a different brand petrol station is not a substitute. Driving an electric vehicle is a substitute for using oil (it’s a substitute on the dimension of energy but not one on the dimension of transport). Using a train to commute to work is a substitute for using a car (on the transport dimension/industry). Substitutes satisfy the same basic/economic need (or utility) using a different technology (in a narrower viewpoint coming from the same industry). Clayton Christensen’s concept of “getting the job done” extends this definition. E.g. there are many things that compete for your recreational time which may be suitable to substitute each other. In this case, the substitutes may be coming from an entirely different industry. How much time does driving to work save you compared to using public transport or UberPool? And how much are you paying more (per trip and per month/year?). How will the price-performance trade-off shift, e.g. traffic speed slowing down due to increased population (permanent factors) or roadworks (temporary factors)? How much would the trip cost need to increase (e.g. due to fuel price increases)? The key is that for different people the thresholds look different. Developing a simpler substitute that scores better on the price-performance trade-off can be a great starting point for innovators. This is particularly true if you are looking developing a substitute for high-profit industries or where products have outstripped the user’s typical requirements. Not all industries are equal. Some are much more competitive than others. Prof Porter has identified the settings that frequently lead to fierce competition. Prof Porter has contributed to the IATA Vision 2050 (pdf) (the International Air Transport Association, the most renown organisation in air travel). The five forces framework has been applied throughout the entire paper. For those not familiar with the airline industry its worth noting that airlines on aggregate make dismal profits (long-run industry profit track below 1% of invested capital). At the same time, vendors and other players achieve more significant returns. Airfares go down in real terms (let alone after adjusting for inflation) and on-board products are getting better, travel becomes safer, i.e. improvements end up with the customer without airlines being able to make more profits (though the last few years have been better and it remains to be seen if this is the beginning of a long-term trend change). The five force analysis shows why this is the case. Now to our own Five Forces analysis. I have written a lot about Uber. Let’s assess Uber’s business model within its industry-setting. 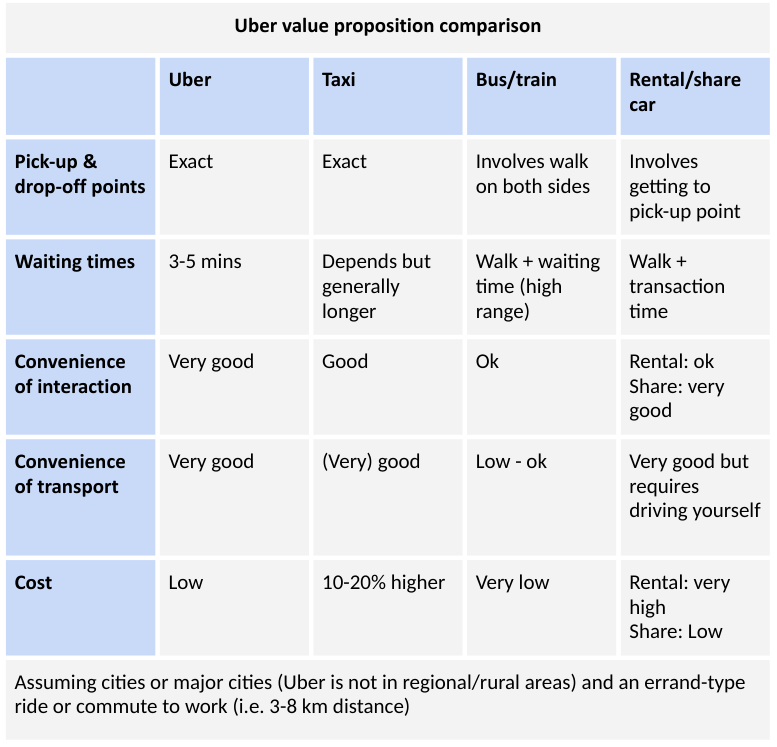 Let’s start with a brief recap of Uber’s value proposition in comparison to its rivals. This plays a role in a number of the forces. The bargaining power of drivers is low but likely rising: after a string of issues co-founder and ex-CEO Kalanick stepped down over a video that showed him arguing and yelling at one of the drivers. One of the first things the new CEO did was give in to a long-standing request of the drivers to introduce tipping which Kalanick had refused for so long. Also, in some European legislation, riders for food delivery companies now have been ruled to be employees of the platform. This could set a precedence for ride-hailing companies further increasing their bargaining power. Uber has spent billions on demand generation. Customer acquisition costs are very high as seen in the battle with Didi. Will investors be willing to fork out capital for a new entrant to fight an already established brand like Uber? 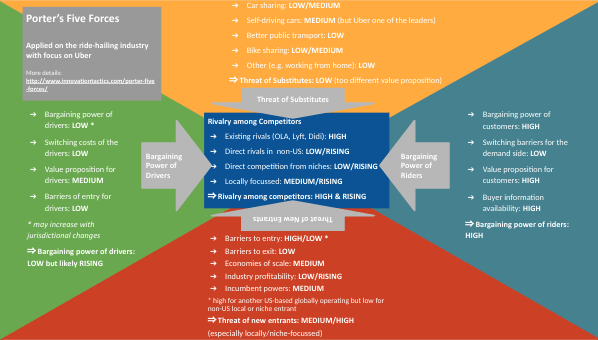 Will a new entrant be able to get to critical mass on the driver side to provide a comparable value proposition (e.g. low waiting times)? The threat of substitutes is low due to the very different value proposition of the substitutes – check the map above. No Mickey Mouse examples on our pages! We are always using in-depth real-life examples. Sign-up for future high-quality articles!